global‑packages The global-packages folder is where NuGet installs any downloaded package. Each package is fully expanded into a subfolder that matches the package identifier and version number. Projects using the PackageReference format always use packages directly from this folder. When using the packages.config, packages are installed to the global-packages folder, then copied into the project's packages folder. Override using the NUGET_PACKAGES environment variable, the globalPackagesFolder or repositoryPath configuration settings (when using PackageReference and packages.config, respectively), or the RestorePackagesPath MSBuild property (MSBuild only). The environment variable takes precedence over the configuration setting. http‑cache The Visual Studio Package Manager (NuGet 3.x+) and the dotnet tool store copies of downloaded packages in this cache (saved as .dat files), organized into subfolders for each package source. Packages are not expanded, and the cache has an expiration time of 30 minutes. Override using the NUGET_HTTP_CACHE_PATH environment variable. temp A folder where NuGet stores temporary files during its various operations. plugins-cache 4.8+ A folder where NuGet stores the results from the operation claims request. Override using the NUGET_PLUGINS_CACHE_PATH environment variable. NuGet 3.5 and earlier uses packages-cache instead of the http-cache, which is located in %localappdata%\NuGet\Cache. By using the cache and global-packages folders, NuGet generally avoids downloading packages that already exist on the computer, improving the performance of install, update, and restore operations. When using PackageReference, the global-packages folder also avoids keeping downloaded packages inside project folders, where they might be inadvertently added to source control, and reduces NuGet's overall impact on computer storage. When asked to retrieve a package, NuGet first looks in the global-packages folder. If the exact version of package is not there, then NuGet checks all non-HTTP package sources. 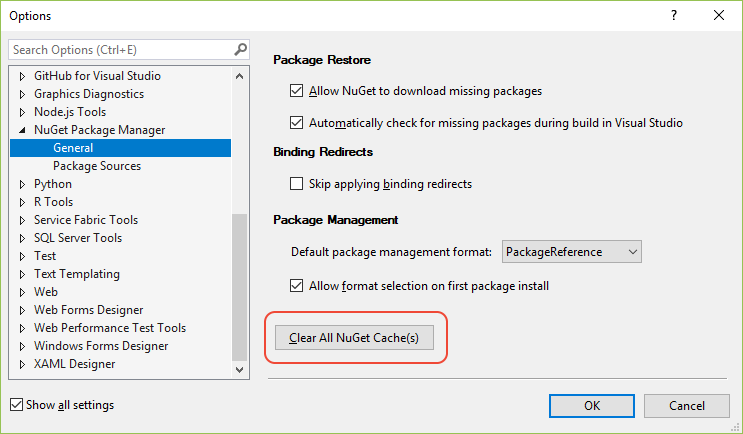 If the package is still not found, NuGet looks for the package in the http-cache unless you specify --no-cache with dotnet.exe commands or -NoCache with nuget.exe commands. If the package is not in the cache, or the cache isn't used, NuGet then retrieves the package over HTTP . For more information, see What happens when a package is installed. To display the location of a single folder, use http-cache, global-packages, temp, or plugins-cache instead of all. Any packages used by projects that are currently open in Visual Studio are not cleared from the global-packages folder. In Visual Studio 2017, use the Tools > NuGet Package Manager > Package Manager Settings menu command, then select Clear All NuGet Cache(s). Managing the cache isn't presently available through the Package Manager Console. In Visual Studio 2015, use the CLI commands instead. One or more files in the folder are in use by another process; for example, a Visual Studio project is open that refers to packages in the global-packages folder. Close those processes and try again. You don't have permission to delete files in the cache. Change the folder permissions, if possible, and try again. Otherwise, contact your system administrator. Shorten the folder names and try again. Du kan også angive feedback direkte på GitHub .